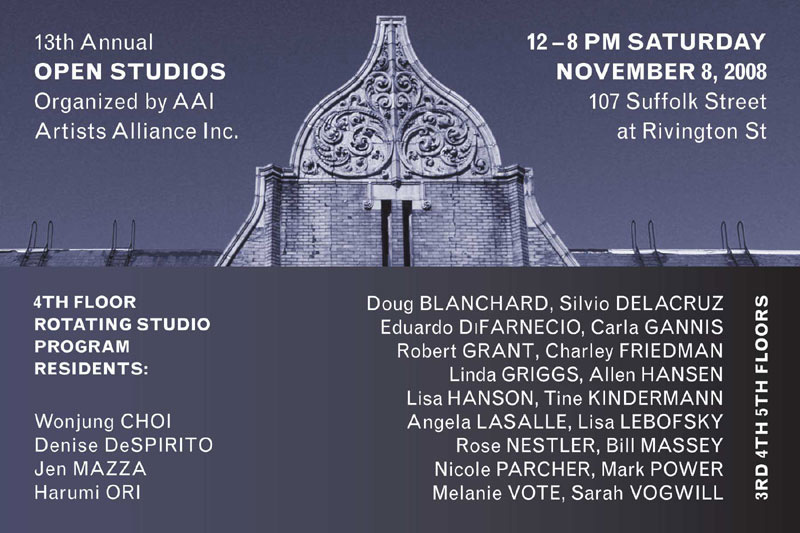 Please join us for OPEN STUDIOS at 107 SUFFOLK STREET. Located in the heart of the burgeoning Lower East Side gallery scene, this event provides an opportunity to visit over 30 contemporary artists who will have their current artwork on display in their studios. Open Studios offers visitors a unique glimpse into the artist’s creative process and a diverse range of practices will be represented, including painting, sculpture, printmaking, works on paper, photography, installation, video and new media. ARTWORK on display at the Clemente Soto Velez Cultural & Educational Center Office on the 3rd Floor: Room 312 and Puerto Rican Artists, Inc. O.P.Art: Room 309. EXHIBITION by Artists Alliance Inc and Cuchifritos Staff and Gallery Assistants on the 4th Floor. DIRECTIONS: F, J, M, Z train to Delancey/Essex St. Walk two blocks east to Suffolk Street. Building is located between Rivington and Delancey with entrance on Suffolk.